Son of the legend in his own time, Stakkato, Stolzenberg made his performance test with outstanding results. Sire Stakkato is the most phenomenal show jumping sensation. Even at the time of his performance test in 1996 Stakkato showed amazing talent for jumping which is reflected in his score and first placing in the criteria. He is described as a medium framed stallion who had very good style over the jumps but he also received very good rideability marks. Stakkato started his career in jumping at the same time that he began stud duties and he has never looked back. In an unusual move Celle sold 50% of this outstanding show jumper to the Bitter stables in Essen. With the renowned Eva-Maria Bitter in the saddle Stakkato became the unsurpassed winner of the Hanoverian riding horse championship at the Dobrock, as well as overriding federal champion in Warendorf. He scored the dream points of 9.9, which has never been done before. He has had a whole series of wins in show jumping competitions. In 1999 he took part in the Federal Championship, in which he became vice-champion. The duos tally of successes meanwhile includes international placements in Grand Prix and Nations Cups. In 2002 Stakkato led the FN breeding value statistics for showjumping for the second time running. He has showed himself to be not only an amazing show jumper but an extraordinary sire of show jumping progeny. His breeding value for jumping is a phenomenal. Sandro also is a very pre-potent sire with many licensed sons, including Silvio 1 & 11, Sandrissimo, Sandro Song, Salido, Skorpio, Simply, Sundance Kid, Sandromit, Sandras, Sandros, Sandro Son, Sao Paulo etc. and appears prolifically in jumping pedigrees. 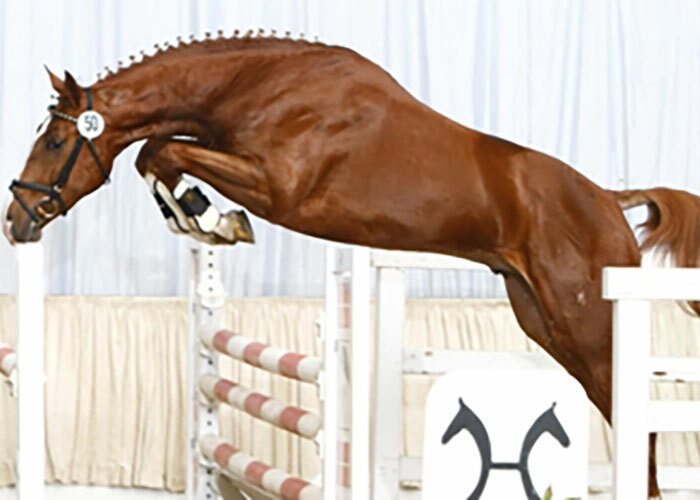 Sandro is known as a modern foundation sire, and former international show jumper, which stood in Denmark until 1985 and then he came to Paul Schockemohles stud. 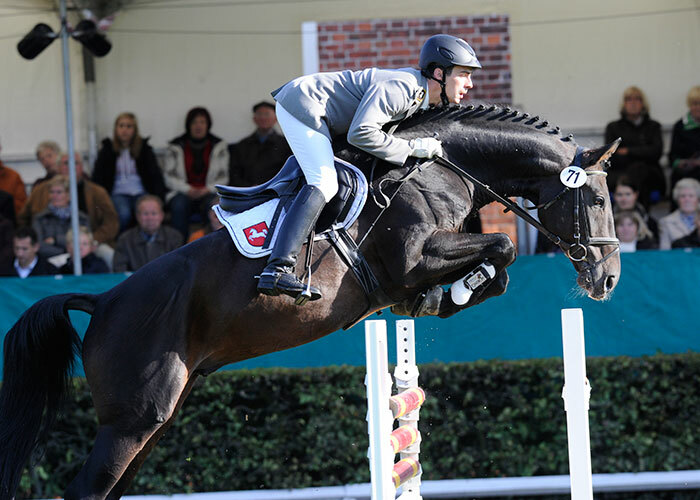 Stolzenberg became runner-up of the 2001 Hanoverian approval, and was declared the best showjumper of his age class. 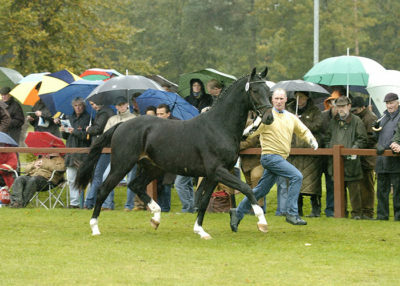 At his stallion performance test he came overall second, clearly winning the jumping index. Stoltzenberg scored 8’s for character and temperament, willingness to perform, and conformation. He was given 7’s for trot, canter and walk. For natural jumping ability he gained 9, 9.5 for free jumping, 9 for jumping under saddle (including a 9.67 for jumping ability) and an incredible 10 for cross country. For rideability he scored 8.33. This young stallion is a jumping machine. He placed first in the jumping section of the performance test with a high 141.88. Victories and placements in jumper riding horse classes of elementary and medium level followed and in the meantime he is already competing at advanced level. Since 2003 Stolzenberg has been in covering service at the Celle insemination station. His son Shaitaan OSF won the Vice Championship title at the Federal Championships of 5 yo show jumping horses in Warendorf in a final that went down to the wire! Under Lutz Wimmer the duo accomplished a fantastic season with various victories in elementary and medium level. A daughter was the brilliant winner at the Mare Show at Dobrock. State premium candidate Silence presented captivating performances and became best show jumping mare of the show. More than 30 Stolzenberg offspring were sold at the Verden auctions among them the mare Saltare who sold for Euro 130,000. 54 offspring are registered competition horses. 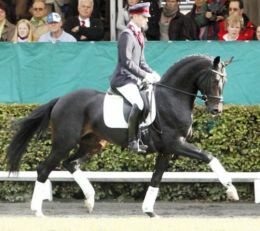 It seems that Stoltzenberg follows in his sire’s footsteps in regards to passing on the qualities of technique, scope, movements and attitude to work to his offspring. Meanwhile all experts talk about Stoltzenberg and his latest breed value estimation which confirms that it is justified that he counts among the 1% best jumper sires in Germany. He has 17 licensed stallions, 32 state premium mares, and 91 auction horses.